On the third day of Navarathri I made fried modak / Maida Kozhukattai for prasadam using all purpose flour (Maida). The method of this kozhukattai is making a stiff dough filling it with the same coconut jaggary fillings. It taste divine is not just enough to explain the taste. 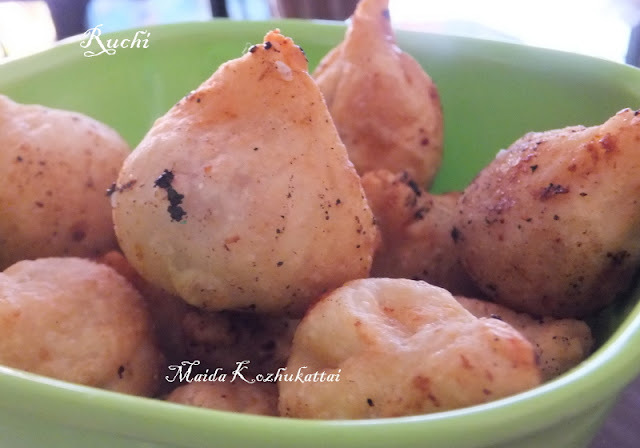 Fried modaks/ Kozhukattai are easy to make and tasty to relish. 1.Grate only the soft white portion of the coconut. Put the jaggery in a heavy bottomed vessel and add ½ cup water and keep on low flame. 2.When the jaggery completely melted, strain it and put it in a heavy bottomed vessel and allow to boil . 3.Add coconut gratings and Cook till the mixture just starts leaving the sides of the vessel and become solid. 4.Add cardamom powder and & ghee mix well & remove from the heat. 5.Knead Maida into a soft, stretchy dough with water and oil. (knead it into dough just as you do for making chapathis). 6.Take Maida flour dough and make small balls out of it and Press it in your palm and flatten it. 7. Make small ball out of the puran that we had prepared.Place puran in dough and close it in a pyramid shape. 8.While stuffing the puran, Roll the dough into uniform balls, seal it completely. 9.Deep fry the modaks balls in oil till they turn brown and serve warm.